PARIS (ESA PR) — The five CubeSat concepts to be studied to accompany ESA’s proposed Asteroid Impact Mission into deep space have been selected.The ideas being looked at include taking a close-up look at the composition of the asteroid surface, measuring the gravity field, assessing the dust and ejecta plumes created during a collision, and landing a CubeSat for seismic monitoring. 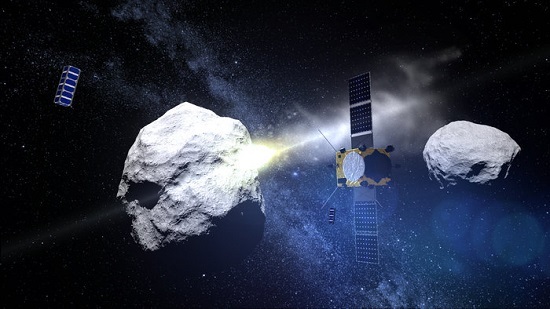 The Asteroid Impact Mission, or AIM, undergoing detailed design ahead of a final go/no-go decision by ESA’s Ministerial Council in December 2016, is a deep-space technology-demonstration mission that would also be humanity’s first probe to rendezvous with a double asteroid. 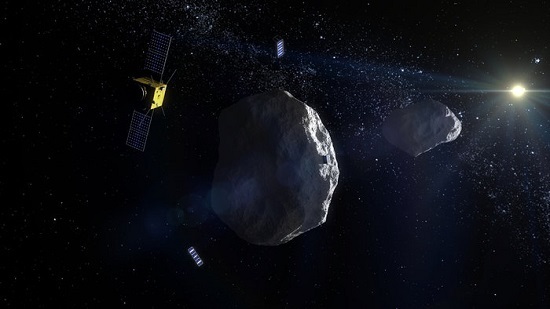 AIM is also set to be Europe’s contribution to a larger international endeavour called the Asteroid Impact & Deflection Assessment (AIDA) mission: the US Double Asteroid Redirection Test (DART) would strike the smaller of the two Didymos asteroids, with AIM on hand for before-and-after monitoring of any resulting orbital and structural shifts. Like a Russian doll, the main AIM spacecraft would carry smaller probes within it: the Mascot-2 lander from the DLR German Aerospace Center, and an additional pair of triple-unit CubeSats. “CubeSats are nanosatellites based on standardised 10 cm-sized units, which are much cheaper and simpler to build than standard satellites, suitable for higher-risk missions such as envisaged for AIM,” explains Roger Walker, overseeing ESA’s technology CubeSat effort. “They would in this case be deployed in the vicinity of the asteroid during the DART impact. “Usually, CubeSats offer an easy means of scientists to launch their experiments into low-Earth orbit. But with AIM we are giving European research teams the chance to design instruments based on the CubeSat standard for deep space, to do specialised scientific work that will complement AIM’s main science goals. “We put out a call for ideas for these CubeSat Opportunity Payloads through the SysNova initiative of ESA’s General Studies Programme,” says Andrés Galvez, Head of the Science Analysis and System Support Unit, which looks at how new instruments could be used in planned space missions. “Through SysNova we set technology challenges to get competing concepts we can then assess in detail ahead of making a final choice. The selected proposals will now be funded by ESA for detailed study, ahead of a final selection to fill the two berths in June next year. AGEX (Royal Observatory of Belgium). A CubeSat touches down to assess the surface material, surface gravity, subsurface structure and of the DART impact effects. Another CubeSat in orbit deploys smaller ‘chipsats’ dispersed over the asteroid. ASPECT (VTT Technical Research Centre of Finland). 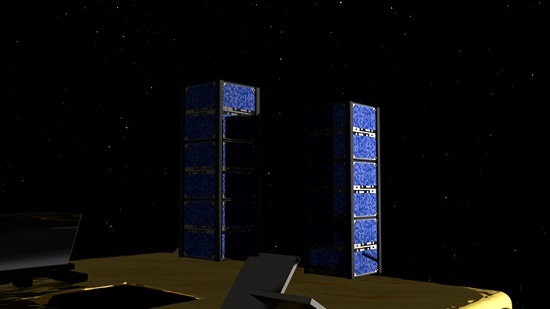 A CubeSat equipped with a near-infrared spectrometer to assess the asteroid composition and effects of space weathering and metamorphic shock, as well as post-impact plume observations. DustCube (University of Vigo, Micos Engineering GmbH, University of Bologna). A CubeSat to measure the size, shape and concentration of fine dust ejected in the aftermath of the collision and its evolution over time. CUBATA (GMV). Two CubeSats measure the asteroid system’s gravity field pre- and post-impact through Doppler tracking of CubeSats, as well as performing close range imaging of the impact event. PALS (Swedish Institute of Space Physics, Institute for Space Sciences IEEC, Royal Institute of Technology KTH, AAC Microtec, DLR). Two CubeSats characterise the magnetisation, bulk chemical composition and presence of volatiles of the impact ejecta, as well as perform very high resolution imaging of the ejecta components. With these opportunity payloads, ESA is applying current European technology miniaturisation efforts to explore our wider Solar System in unprecedented ways, lowering the cost and risk of interplanetary missions.